The Poké Transporter, known in Japan as Pokémon Mover, is a piece of software that comes with the download of the cloud storage app, Pokémon Bank and allows for you to transfer Pokémon from Pokémon Black, White, Black 2 & White 2 over to your Pokémon X & Y games. Poké Transporter only requires one 3DS system and is a simple programme to use, allowing you to transfer batches of Pokémon in one go by placing them into the Pokémon Bank box. These Pokémon are transferred one way, and cheated Pokémon are unable to be transferred. Online is required. The method of transfer is relatively simple. When you load up the specific Poké Transport app, you will have the ability to select a Box of Pokémon in your Generation V game. When you have selected the box, it will remove any items from the Pokémon and place them in the bag, then upload the Pokémon to your Pokémon Bank system using the Internet. There is one restriction, however. The Pokémon you transfer are only the Pokémon within Box 1 of your Generation V game. If you wish to transfer more Pokémon, you will need to move them into Box 1. You can transfer any Pokémon within your box, includingones knowing HMs, but you cannot transfer Eggs, Black Kyurem or White Kyurem. 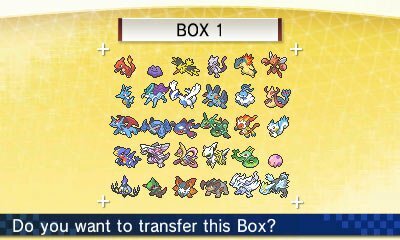 When you access your Pokémon Bank system, the Pokémon can be found in the special Transport Box, where they can then be moved to one of your 100 Pokémon Bank boxes or down into a box in Pokémon X & Y. You cannot transfer if the Transport Box is filled and you cannot move Pokémon into the Transport Box in Bank.